​The House of Representatives on Tuesday voted to give a P1,000 budget to the Commission on Human Rights for 2018. At least 119 lawmakers voted to approve petition while only 32 voted against it. With a measly budget, CHR's operations for the next year are rendered ineffective. The projected population of the Philippines will spike up to 105,758,850 by the end of the year. That means the protection of our rights cost only P0.0000095 per person. By acknowledging the coin as a bona fide denomination of the currency, we acknowledge its utter lack of value in protecting our rights, and the sheer absurdity of the decision. 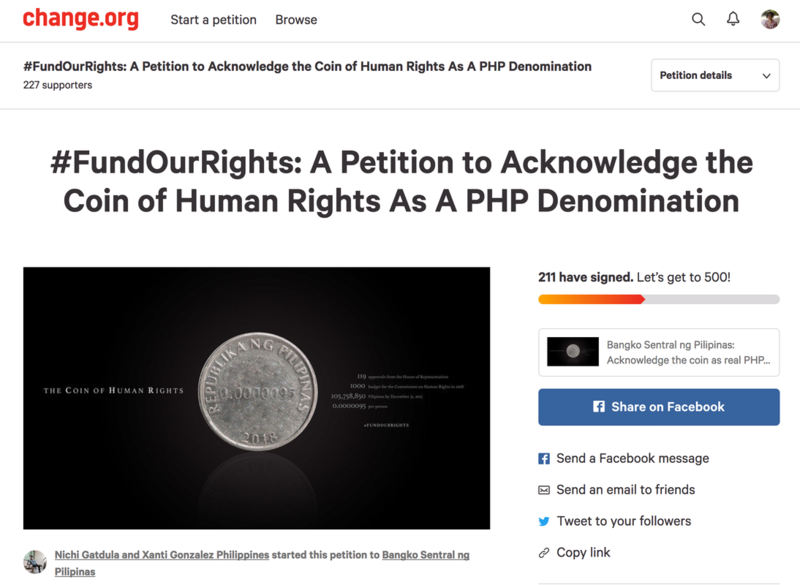 The signatures garnered are a testament that we stand by the 32 lawmakers who said 'no' and the millions of Filipinos that deserve the for their human rights to be protected. And in turn, we strongly hope that the decision be revoked by the Senate of the Philippines.